and a link will be sent to the email you provide. Unknown vulnerabilities in applications are an opportunity for hackers to exploit and gain access to your network. With high severity vulnerabilities increasing, it’s important to for your customers to stay protected from targeted attacks – even the ones they don’t see coming. Trend Micro’s Zero Day Initiative (ZDI) is the leader in global vulnerability research and, in 2016, reported the most verified vulnerabilities, with 52.2 percent of the global total of 1,262. 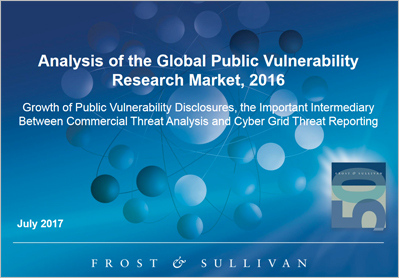 Register to receive this report from Frost & Sullivan to learn more about vulnerabilities in the market today and which ones were recognized by the Trend Micro Zero Day Initiative. ©main Trend Micro. All rights reserved.